Welcome to Enfilade Studios, the organisation bringing technology to the Range with Rifle Target: Rifle Shooting Database. But, what is Rifle Target: Rifle Shooting Database? Rifle Target: Rifle Shooting Database is your shooting solution - encompassing a shoot management, plotting and coaching analysis tool. See below for high-level feature overviews, or read an overview, or download a demo now. Gunfire directed along the length of a target, such as a column of troops. A target vulnerable to sweeping gunfire. Put simply, Enfilade is appropriate for the nature of Rifle Target: Rifle Shooting Database. But you can also define your target discipline in Rifle Target. Your primary interface with Rifle Target: Rifle Shooting Database is its simple but powerful plotting system. Quickly plotting your shots is as simple as point-and-click during or after you fire. Once plotted you gain the immediate benefit of Rifle Target's statics and analysis tools. Rifle Target: Rifle Shooting Database enables you to record your call and your sight settings. It will automatically handle scoring, minute of angle calculations and more. . .
Use the built-in targets and shooting forms in Rifle Target: Rifle Shooting Database or, if you need, define your own. Then create a new record to represent your shoot and start plotting. You can store attributes and tags about the shoot too. Was it raining for a particular shoot? tag it. What shooting range were you at? tag it. What competition? tag it. Had a coach? tag it. Filter your records based on these tags to easily locate a specific shoot or to compare your shoots. Rifle Target: Rifle Shooting Database can help you performing coaching analysis. For example, use the Scatter Plotter to plot particular shoots together. Do you think you tend low-right at 600 yards? Plot all your 600 yards records together and see. The Scatter Plotter is particularly useful for wind coaching analysis - you can split the scatter by plotting all shots that land downwind on one half of the plot and upwind-landing shots on the other. Rifle Target: Rifle Shooting Database can help you performing statistical analysis. Calculate the mean horizontal deviation or the mean group radius or a large number of other shot statistics for a selected set of records. You can then plot one or more of these statistics on a graph and compare the changes and progressions. The help file explains the nature of each statistic along with its algebraic definition and, where relevant, suggested use. Enfilade Studios has released Rifle Target: Rifle Shooting Database v3.1. 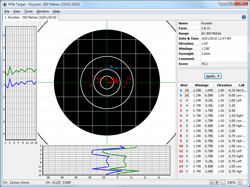 Building upon the previous v3.0 release, developed England Fullbore Rifle Team, Rifle Target: Rifle Shooting Database v3.1 adds significant new features to the product as requested by our customers ensuring it remains the premier solution for plot management, analysis and coaching of target shooters. New target zooming support allowing automatic focus on the target aiming mark. 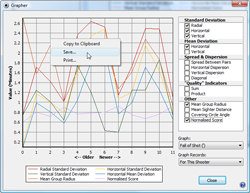 Zooming is supported on the main target plotting screen and on the statistical scatter plot tool. Organise information more intuitively and quicker with support for cut, copy and paste of records on the database screen. 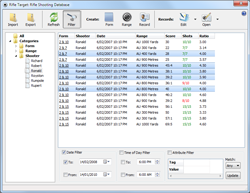 Quickly duplicate whole shooters, forms or ranges worth of records with the Clone in Bulk tool. Improved database export and import to allow transfer of information between computers quickly and robustly. Enable or disable whole disciplines in Rifle Target: Rifle Shooting Database with one click on one screen. Enable disciplines as you have a use for them. Add new ranges to new disciplines. Re-organise existing ranges into disciplines that suits your shooting or management style. Improved scatter plot tool - now allowing individual shots (based on number or sequence) to be analysed across multiple records. 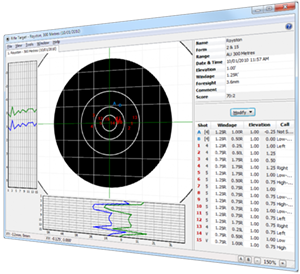 Rifle Target: Rifle Shooting Database v3.1 is an incremental major version of Rifle Target and is may be trialled for free for 30 days whether or not you have previously trialled the product. 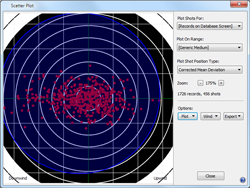 Download Rifle Target: Rifle Shooting Database v3.1 Now!